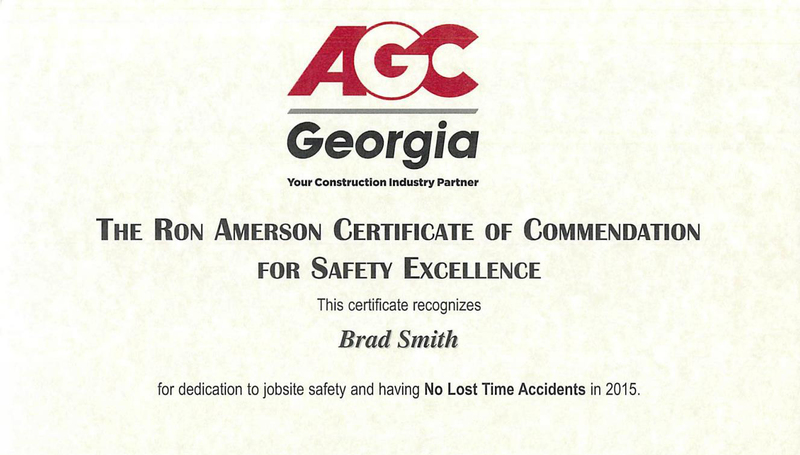 Young Contracting is proud to announce that all of our superintendents were recognized by the AGC with the Ron Amerson Certificate of Commendation for Safety Excellence for having No Lost Time Accidents in 2015. Congratulations to all the winners! In an effort to maintain high safety standards, we would like to restate our safety mission: Safety Mission Statement YOUNG CONTRACTING/SE, Inc. is committed to the protection of ALL of its resources from losses due to incidents or accidents. To meet this commitment to protect our employees and our property, YOUNG CONTRACTING/SE, Inc. will maintain a safe and healthful work environment on all of its job sites, and will comply with all Federal, State, and Local regulations. Our objective is to eliminate all hazards that may lead to personal injury or illness, as well as fires, damage, or loss of property.